The New Haven Railroad is one of those uncommon lines to find on film. Greg Scholl has this all color collection of vintage 1950’s 16mm films. Kent Cochrane was a former US Navy combat cinematographer, during World War 2. He went trackside to film the New Haven Railroad. Using 16mm film, and all color, we will see this quality, from the 1950’s. Being that it was shot on 16mm film, it is very rare material to view. The camera is steady and the views are colorful. There are numerous train runbys. This collection has regular operations and fantrips. Mr. Cochrane did get around on New Haven. Many locations are filmed, in all seasons. The soundtrack is a classical style (more or less) musical background. As noted in the introduction, no original sounds were recorded, and the producer has chosen not to dub in sound. Generally, I am good with most musical choices. We are here to watch trains. As long as the music doesn’t annoy me, it is fine. So, on with the show. John Edwards Hingsbergen is our narrator. Clear and concise, his delivery is professional. Some errors in equipment identification are corrected, with on-screen graphics. There is a good amount of history within the show. The script was researched by New Haven Railroad Historical & Technical Association. They deserve a mention here. The script is the narrative. Excellent amount of the right information. Plenty of detail, with interesting anecdotes. As in New Haven Mainlines, the script is an integral part of this program. There is a chapter menu. No maps are present for the main feature. The narrative shares locations constantly. Maps would have helped those, who are unfamiliar with the area covered. However, the narration is detailed and does suffice. Locomotive types get a high level of coverage. This is much needed. New Haven had a varied roster. The inclusion of electrics furthers the need for the many call-outs. Only a single steam locomotive is in attendance. A 1953 fantrip, behind NH # 3016. This was the final run of this locomotive. The chapter runs about 10 minutes. The producer has informed me that Mr. Cochrane was chasing this train excursion. That chase, sometimes precluded the use of a tripod. Hence, the handheld camera. A Berkshire trip on a Budd RDC car in 1952. Looks like a Connecticut to Massachusetts ride. Some shots are out the front windshield. Many photo ops were included. The Highland Line has Alco DL-109’s. Alco FA’s ,RS-3’s also operate on this line. Semaphore signals are a nice extra touch. A 100 car freight passes by with an Alco ABBA lash-up. It is funny to see the long freight come to a stop, so a single RDC can take the siding. The freight was too long for the siding, and meets like that that, did occur on that single track line. A one of a kind. Alco DL-109 ‘The Cranberry’ in a red and white scheme. The Electric Division contains those unusual electric locomotives. Big EP-5’s and the unique 1956, ‘talgo-type’ sets. This segment is on the four track mainline. Connecticut to New York. The pace quickens, a multitude of varying trains are viewed. The John Quincy Adams and The Daniel Webster, are some name trains. Mail trains and FL9 led passengers too. By modern standards, the wide variety is unreal! An extremely busy, and thrilling chapter. The Maybrook Line shows busy freight traffic. Alco FA’s and GP9’s are frequently found in lash-ups of 3 and 4 units. Some Budd RDC cars are also seen. Green and gold paint is common on the locomotives. There are numerous McGinnis paint scheme engines.GP9, RS3, Alco FA’s and the FL9 classes are all here. Another enjoyable, highlight chapter. The camera is steady and he definitely had his own viewpoint. The shots do have some variation. Plenty of trains were in the pretty fall colors. The film appears to be, the original images. Good colors with balance overall. There are also some back-lit shots. The terrain effects that at times. Alternative setups would be, in the lake or climb down from a hill. There are views, with some distance. These have a better overview of the train. The wider four track territory fared better overall. Conversion to DVD has a bonus feature section. An RDC train trip to Cape Cod. It is filmed from the rear of the train. While it always feels strange to have the reverse view, at least the inclusion. The color balance isn’t as fine as the feature. The viewing of the stations, towns, cars, terrain and right of way, is interesting. We end up in Providence. This show has that rarity factor, going for it, in a big way. Roads like New Haven, just weren’t getting attention. Those with movie cameras, chased popular railroads. We are fortunate to have anything available- at all. 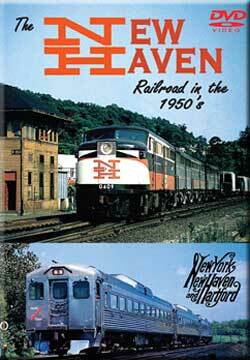 The New Haven Railroad in the 1950’s, is a good one to have. There are some previews of other Greg Scholl train videos included, as well. Combine it with New Haven Mainlines, also by Greg Scholl. You will then have nice collection of this early, fallen flag railroad. A good look at the New Haven Railroad. Interesting and colorful show. This entry was posted in ATVR Reviews, Greg Scholl and tagged American Train Video Reviews, electric, Railroad, steam train, Train DVD, transportation by William J. Hudson. Bookmark the permalink.